Acute GvHD is seen following allogeneic SCT, both standard and RIC, and is more common in mismatched or unrelated SCTs. A similar syndrome is seen very occasionally following autologous SCT. Engraftment and subsequent GvHD may be seen inadvertently following infusion of non irradiated cells into immunoincompetent patients, or when blood donors of the same HLA type are used, i.e., usually following the use of a family donor. The onset of aGvHD is usually between days +10 to +30 with a median of around day 20. The IBMTR and Glucksberg criteria were prospectively validated in 607 patients receiving myeloablative T cell-replete allogeneic stem cell transplants between 1996 and 1999. Both systems were predictive of mortality at 100 days and one year post-transplant. Rowlings, P. A., et al. (1997). "IBMTR Severity Index for grading acute graft-versus-host disease: retrospective comparison with Glucksberg grade." Br J Haematol 97(4): 855-864. Conditioning toxicity, e.g. TBI, that exposes neoantigens, enhances cytokine release, augments APC presentation of alloantigen to donor T cells and initiates the immunological storm. Donor T cell expansion triggers the cytokine and cytolytic apoptotic injury that manifests as acute GvHD. Immunocompetent T cells and probably other immunocompetent donor cells, e.g. dendritic cells, damage host tissues primarily those on the body surface eg skin, gut, biliary tract, mouth, genitalia, and in cGvHD also the lungs. Clinical diagnosis is appropriate if the classical constellation of symptoms is present. Biopsies may be helpful if the diagnosis is unclear but should not delay management (1A). In severe liver dysfunction the patient should be discussed with a hepatologist to discuss the need for biopsy. Both upper and lower GI symptoms may also be due to conditioning, drug toxicity or allergy eg cyclosporin, antibiotics. Bacterial and viral infection, e.g. C difficile, CMV, HSV etc may all cause be confused with GvHD. Discuss with endoscopist and request that gastric bile acid is reported on and distal duodenal samples are taken for microbiology and histology. It is important to differentiate diarrhoea and steatorrhoea. Patients with diarrhoea without jaundice or skin GvHD should be referred for both upper and lower GI endoscopy. 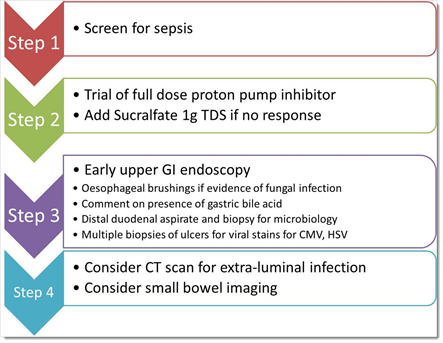 In patients with symptoms of GI GvHD it is important to exclude infectious causes. Specifically consider testing for CMV and Clostridium difficile. Other infectious pathogens include giardia, amoebae, rotavirus, HSV, bacterial pathogens and fungae. Drugs used in transplant patients which may cause diarrhoea include antibiotics, proton pump inhibitors and MMF.